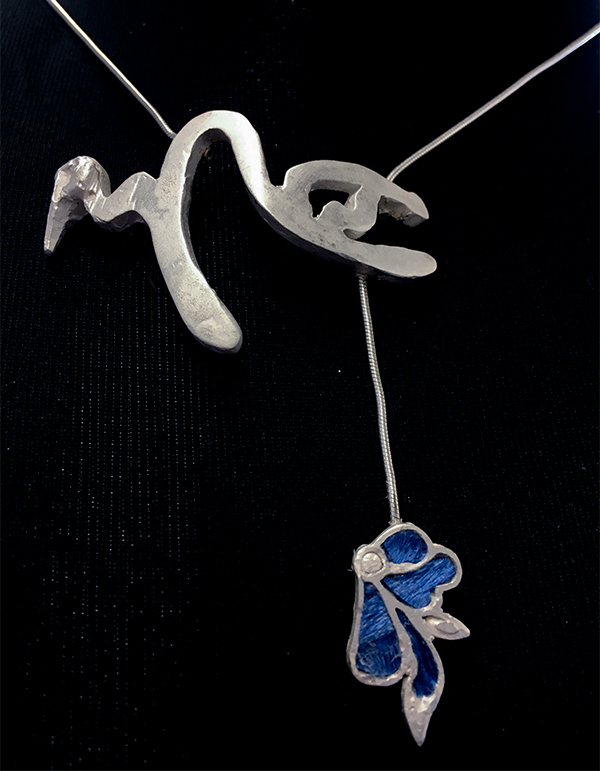 “The Kingfisher Blue” consists of two individual necklace designs that were both inspired by Chinese cultural elements. Kingfisher is an ancient Chinese jewelry technique that applies kingfisher bird’s feather on to a silver plate. In this project, I experiment with various methods to find an alternative for Kingfisher technique, which is banned for animal protection purposes. The necklace on the left is cast in silver, inspired by calligraphy and decorated with silk. The other accessory is inspired by the indigenous tribe Miao’s wedding garment. The piece involved many techniques including champleve, hydraulic press, enamel , and hinges. The goal is to represent the beauty of ancient Chinese jewelry in a contemporary and environmentally friendly approach.